Based on a ranking list that was established by the EU Scientific Evaluation Committee, the E-Rare funding bodies recommended the European young investigators network for Usher syndrome (EUR-USH) coordinated by Dr. Kerstin Nagel-Wolfrum from Johannes Gutenberg University Mainz for funding. Out of 82 submitted projects, EUR-USH was among the 11 excellent scientific projects that were chosen after a competitive two-step scientific evaluation by peers. In October 2013, researchers held their kick-off meeting in Nijmegen, the Netherlands. In addition to Johannes Gutenberg Mainz University, Germany, five other research institutions, namely AIBILI and IBILI in Coimbra, Portugal, INSERM institutes in Paris and Montpellier, France, and the Radboud UMC in Nijmegen, the Netherlands, will participate in the EUR-USH collaborative project. Financial support for the project will be provided by the national funding agencies, the German Federal Ministry of Education and Research (BMBF), the Portuguese Foundation for Science and Technology (FCT), the French National Research Agency (ANR), and the Netherlands Organisation for Health Research and Development (ZonMW). In the EUR-USH network, young investigators with different backgrounds in science, clinical medicine, and genetic diagnostics synergize their expertise to shed more light upon the rare genetic disease Usher syndrome (USH). USH is the most common form of hereditary combined deaf-blindness in man. Since USH is genetically and clinically heterogeneous, diagnosing this disease is very challenging. So far the pathomechanisms resulting in the blindness of Usher patients are not fully understood. While the loss of hearing can currently be compensated by the use of cochlear implants, there is still no treatment for the associated blindness. The EUR-USH project is divided into three components. The first component involves two Portuguese and two French work groups. Among their tasks are the improvement of Usher clinical diagnosis and the elaboration of significant markers for Usher disease progression. Results of the study will be uploaded into the newly established EUR-USH database. In the second segment, work groups in the Netherlands and Germany will concentrate on identifying the molecular pathogenesis of Usher syndrome. By applying proteomic and imaging approaches they aim to identify novel members of the USH interactome to unravel common cellular pathways in which USH proteins are involved and provide candidates or modifier genes for USH and related retinal degenerations. In the third segment, groups will be developing treatment methods for the ophthalmologic component of the disease. They will evaluate two different approaches, gene augmentation and translational read-though, to treat the progressive retinal degeneration of Usher syndrome patients. The scientists hope that the interdisciplinary collaboration will help further understanding of the clinical, genetic, and molecular background of Usher syndrome and will provide a valuable contribution to possible treatment approaches. The primary objective of the European research team is to improve the quality of life for Usher patients. 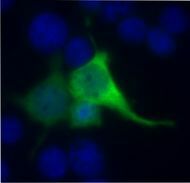 Fluorescence microscope image of cells with a nonsense mutation in the Usher syndrome 1C gene (USH1C/harmonin). In the presence of NB54, there is read-through of the USH1C mutation. The treated cells produce the healthy harmonin protein (green).